I have been asked a lot, particularly by journalists, about the vagaries of the university application system – and clearing in particular – this past week. It is a peculiar, difficult and stressful process that can last for months between submitting your UCAS form and having your place confirmed. As I sought to explain in an article in the Guardian earlier this week, however, the main alternative option of having everyone apply after they have their results would likely bring some different challenges. It has been said many times before that this year’s admissions round is a buyer’s market, meaning applicants are better placed for securing their preferred option than at any point in recent memory. In fact, each year they go on being better placed than the one before (though this could well change in the medium term). That is why, for example, there has been an explosion in the number of unconditional offers. It is easy to forget how different this is to the past. When I first worked in higher education policy over a decade ago, one of my first tasks was to calculate how many applicants were likely to go without. There were lots of newspaper headlines about the tens of thousands (sometimes hundreds of thousands) of UCAS applicants who would not get a place. Even six years ago, just at the point when fees went up to £9,000, it was said well over 100,000 applicants would fail to get in. It was a seller’s market more than a buyer’s one. As last night’s Radio 4 programme, The Briefing Room, showed, there is a trade-off between the funding system you opt for and the number of places you can afford to fund properly. But while there used to be more applicants than places, there are now more places than there are qualified applicants. A combination of fewer 18-year olds and the removal of student number caps have put UCAS applicants in an incredibly strong position to get a place on the course and at the institution they want, even when they might not have achieved the grades they might have hoped for. Yes, there are some pressures working in the opposite direction, such as the perceived extra hardness of A-Levels. But universities want to fill their places and, so long as they believe an applicant has a good chance of thriving and not dropping out and won’t affect their performance metrics too adversely, they will be keen to offer them a place, often even if the applicant’s results are less good than the published entry tariff for a particular course (and especially, perhaps, if the applicant has contextual factors to take into account). It is not just because each student brings a high tuition fee with them, although that is important; it is because, in general, universities are like other successful institutions in other fields in their desire to grow. However, that doesn’t mean that everyone will get the place they want. There are plenty of circumstances where that may still not happen. For example, if you are after a place on a highly-competitive course at a highly-competitive university, places are still tightly constricted – think Medicine at Oxbridge. If universities do not have the lecturers in place or the lecture hall space or they cannot live up to their commitments to offer entrants accommodation and a decent student experience, then they will stop recruiting. The removal of student number controls has confirmed many universities want to expand. They do have rubber walls, but they do not have infinitely-expandable walls. This is why it is still wise to act fast if entering the clearing process. remember, time is on your side – nothing is certain and it is likely to be (even more) of a buyer’s market next year so, if you do not want to be rushed into a decision, take time to consider all the options, which include courses that start at non-standard times, foundation courses, degree-level apprenticeships and so on, as well as the regular full-time, three-year honours degree. Amidst all the current frenetic activity, we should spare a thought for the job that admissions offices have to do (and do while so many other people are on holiday). They have to find the best possible match between courses and applicants and they have to press the stop button on their recruitment to each course at the right time, not to mention getting all the enrolment and welcome activities in place for when students actually arrive. It is incredible hard to get all this exactly right. Until you have your applicants’ exam results, you don’t know how many of your firm offers will lead to new students; nor do you know how many applicants who have put you as their insurance offer are likely to turn up. Even after the ‘firm’ and ‘insurance’ offers have all been finalised, you don’t know how many of those who have accepted a place will actually turn up at the start of term – or still be there at the end of it. On top of this, the clearing process is a rushed one when less notice can be taken of the personal statements on applicants’ UCAS forms or references from schools. So there is an element of luck for the institution as well as the applicant. Hitting the target number on the head is worse than landing a jumbo jet on a postage stamp – it’s like trying to land a fleet of Learjets on a series of postage stamps. One of the many advantages of removing student number controls was the end of the silly regime whereby universities wanting to take willing students were fined if they did so. But we still pretend admissions is a precise science when in fact it remains an inexact art. Finally, higher education institutions can’t expect much help from any official sources in their future planning on student numbers. HEPI has for many years complained about the inability of the Office for Budget Responsibility to produce useful forecasts of future student numbers. 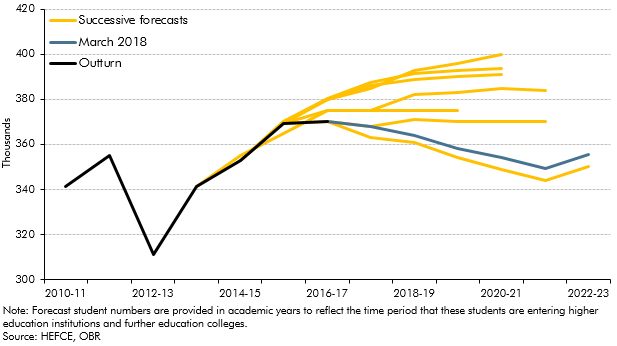 This chart of theirs resembling the branches of an out-of-control tree of the tributaries of a wayward river shows how regularly they have changed their own near-term forecasts for future full-time student numbers in England. They may think the chart shows an admirable willingness to alter their forecast in the light of events; in fact, it just shows how their predictions manage the mean feat of being simultaneously ridiculously simplistic and unbelievably precise. Yet this is the best official data on which higher education institutions are expected to plan their future and the OBR have proven resistant to serious discussions about better ways to do it. Surely, if we want institutions to have the places we expect for our children – or to land a jumbo jet on a postage stamp – then official bodies could do a better job of lighting up the runway? ← How should we respond to reports of a declining graduate premium? Thank you Nick. Thoughtful as ever. I also prefer to take the long view in this. It really was not ‘better in the old days’. This is a great time to be an applicant. Never before in history have there been so many places available at so many universities. Never have so many been able to get into tertiary and higher education. Students from from poor families have never had better higher education opportunities than now. Until we get a consensus on why we have Universities and what is the best way to achieve the objectives there is little point in the “before or after” debate.